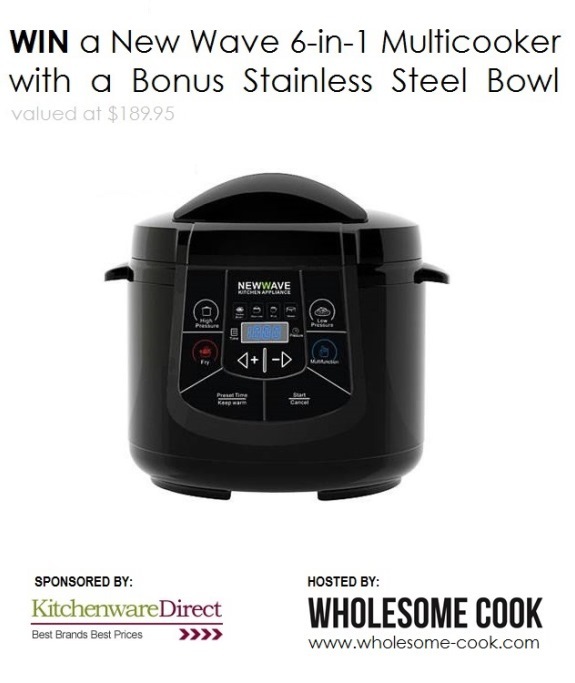 Thanks to Kitchenware Direct and Wholesome Cook you can now WIN a NewWave 6-in-1 Multicooker with a spare bowl, valued at $189.95! Congrats to Kylie R. who won this awesome prize! From NewWave, the Makers of ThermoChef and the Slow Juice Extractor, comes the 6-in-1 Multicooker. To be honest, I am now kicking myself for not getting this unit when I bought my slow cooker less than a month ago, and I am very envious of whoever wins this one. Why? Because the all-in-one one unit handles the workload of a pressure cooker, slow cooker, rice cooker, soup pot, deep fryer and electric pan in a compact easy to use device. I think the option to have a slow and pressure cooker in one device while saving precious cupboard or benchtop space is pure genius. In fact, I recently read that the pressure cooker is one of few appliances that made the Australian Women’s Weekly’s editor’s must have list. No surprise there as it combines the ability to have “slow-cooked” meat in minimal amount of time. There have been many times when I would have loved to have made tender beef cheeks or pulled pork for dinner, but didn’t have the time to slow cook the meat – the multicooker would have made it possible. Besides it can be used as a deep fryer (perfect if you want to indulge a little and make some delicious quark donuts), a soup pot and a rice cooker – saving time and stove-top space. For the more health-conscious users the multicooker’s rice cooker function is also capable of steaming. 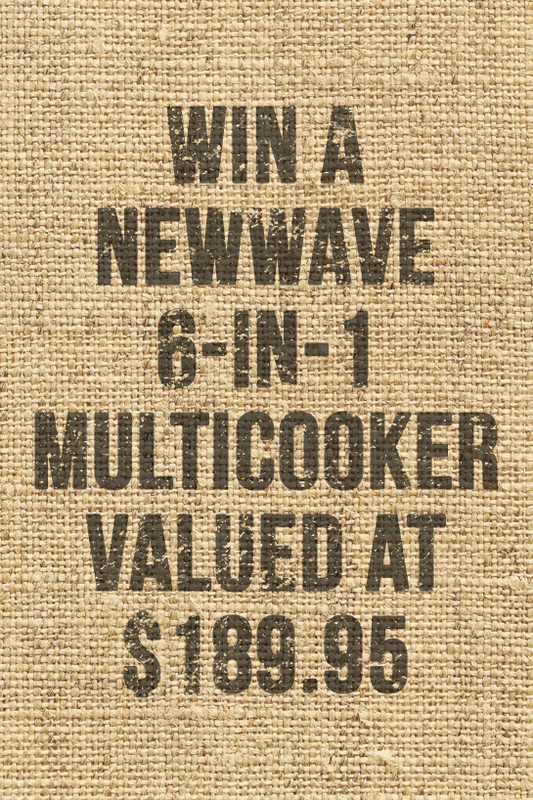 Thanks to Kitchenware Direct and Wholesome Cook you can now WIN a NewWave 6-in-1 Multicooker with a spare bowl, valued at $189.95! Leave a comment on this post telling me what you would make first using the NewWave Multicooker? Register your entry via rafflecopter below. Giveaway is open to anyone with an Australian postal address. One main entry per person. Multiple bonus entries are allowed as specified in the Rafflecopter form. Giveaway closes midnight AEST Sunday 25 August 2013. One winner will be picked at random and announced on this post on Monday 26 August. That sounds intriguing… would love to know more about the recipe! Its a mexican inspired slow cooker shredded chicken meal (i’m going through a mexican phase i think). Found it while looking for healthy slow cooker recipes on pinterest. Mmmm! Where to begin? Perhaps a chicken and sweet potato curry for a delicious week night meal. Braised pork neck would be great, usually takes hours in the oven. Stainless steel bowl? Awesome! I can finally throw out my (evil) teflon coated rice cooker. I think the first thing I will make is beautiful, fluffy, coconut rice… yum! I’ve recently swapped all my pots for stainless steel too Jules – they are just as easy to clean and I know they are better for us. Good luck! My first dish when I win this awesome appliance would be a mushroom risotto. I would make pea and ham soup. Yum. I would make my husband his favourite for his 40th Birthday, garlic and herb lamb shanks with a side of creamy mashed potato, yum! Rice- definitely rice. We have long since outgrown our 4qt rice cooker & desperately need a larger one. So that is what we would use it for at least several times a week- then add in all those other great things that it does- I think I may use it every night. I’m a college student, so… Everything! I think my favorite would be vegetarian chilli, a family tradition for Halloween night. Delicious, and makes the house smell great when the trick-or-treaters come around! I would make Lamb Tagine, the aroma that fills the house while its cooking is amazing on a cold day! Moroccan Chicken – the spicey aroma fills the house, vegetables are done to perfection, and the meat falls off the bone remaining tender and moist. If I were to win this, I would take it to our family beach house in the summer, because the apartment we stay in has no stove. So this would allow me to cook everything I want to cook, and with ease and comfort. What would I make? Sausage & apples, or sausage & sauerkraut, noodles, rice, chicken stew, chili. The question is really, what would I not make with it? This would make my life very much easier. I’ve heard you can cook a whole roast in these and it’s tender and delicious, so that’s the one for me! The first thing I would make is some home style bbq pulled pork. There’s endless options with what to do with the shredded meat afterwards – burgers, nachos, pizzas, tacos! Thai pumpkin soup I think! I believe I would start with a wonderful roast with all the veggies then move on to orange chicken with rice. I’m eager to try and master the skill of the perfect chicken and mushroom risotto. Being a multi-function cooker, in theory it should be a relatively easy task! Slow cooked Lamb and chickpea casserole would be my first option ,this would really help with daily cooking ideas what a great appliance ! 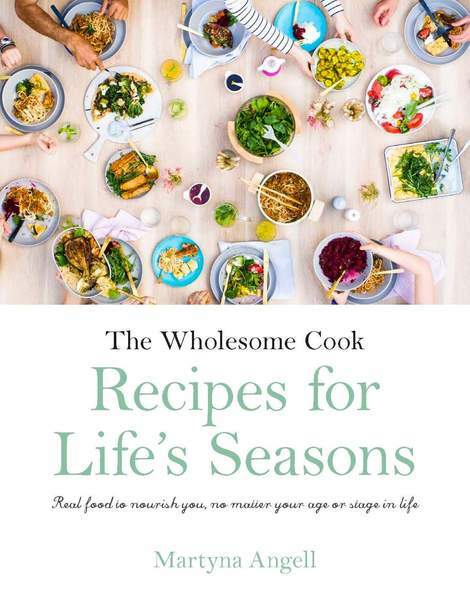 I am already subscribed to wholesome cook. I could make my absolutely awesome lentil dahl with spinach and sweet potato, and while that was maturing I could cook some basmati rice in the other bowl. What a wonderful giveaway – thanks for offering it! No contest – I would slow-roast trimmed lamb shanks, spiked with garlic and rosemary and a drizzle of balsamic to deepen the flavour and serve it with spicy sweet potato mash and steamed asparagus! All welcome at my house!! Lamb casserole, perfect for winter. I would have to go with a slow braised lamb casserole with split peas and meat that falls off the bone. Its perfect weather for it! I would make a sausage, pumpkin and nut stew!! I have never used a pressure cooker and would love to try this function out on beef cheeks, to create a tender meat meal, Looks like the best appliance ever. A roast lamb shoulder with heaps of Greek flavour like garlic, oregano, lemons Yummmm. I would surprise my husband with our favorite wishful dinner. A turducken! It would make our 7th anniversary coming up in Sept. fabulous and romantic. We love to cook and experiment, recreating splurge foods a healthier way! I’m entering this for my dear friends living in Melbourne who are getting married next month. 🙂 If I win, this would be such a lovely wedding gift! I’ll tell her to make a good pot of stew for me when I come over for the wedding. LOL. My old pressure cooker has a non-stick pot, I would love to cook with the stainless steel bowl. I would make steel cut oats for a week. I would make a stew to be served with polenta: a traditional family favourite. I’d cook a delicious lamb and vegetable casserole. Slow Cooked Oriental Pork With Mandarins..
A gorgeous chuck-me-in-the-multi-cooker-and-forget-about-me recipe full of lovely Asian flavours and elevated by the use of fresh sweet mandarins and juicy pork. -Over the years I have cooked it with a few variations here and there but the base recipe remains the same. Pork, baby onions, lots of garlic, sweet mandarins and Asian spices slow cooked to a flavourful and tender dish that is perfect for sharing over dinner. The absolute first thing I would make a Chilli and Coconut Beef curry with crispy coconut pancakes. Have been looking at that recipes for a year now. 🙂 Seems like a good time to upgrade my basic cookware, winning this would be a good place to start. Lovely rice pudding for the family – delicious and filling! A slow cooked roast lamb & veg!! Wow, wasn’t even aware that this existed. Sounds amazing and with my limited cupboard space – well, even more benefits. Too excited to think of one but do love tender slow cooked rogan josh lamb shanks. Just add rice, a red wine and an open fireplace and we are in heaven! These recipes are making me hungry! I’d have to do something simple first, home grown pumpkin soup for the win. I’d cook rice, casseroles, veggies and soups, ‘roast’ for Sunday dinner and I’d check to see if it’s possible to cook steamed pudding too. I love to make pulled pork. I usually cook it slowly on the stove til its all tender and yummy and then serve it in fresh white rolls with mayonnaise and lettuce. Its the best thing ever. I would love to make it in the NewWave 6-in-1 Multicooker! I don’t have a pressure cooker and haven’t really ever used one so I would love to try something in the pressure cooker setting, what yet I don’t know! I would try a piece of corned meat and vegetables maybe. I would make a chick-pea curry without having to boil the chick-peas for hours first, yay! It’s gotta be slow cooked BBQ pulled pork with some corn thrown in at the end because I love corn! The perfect rice for fried rice and the a juicy pork neck for pulled pork rolls so yum! I’d make my Butter Chicken. Yum! Spinach pakoras because that would give the deep fry option a work out (how does it compare to our $30 deep fat fryer?!) and because I LOVE them! Love Indian so would make a delicious Butter Chicken. Slow cooked Moroccan Lamb Shanks served on a bed of sweet potato mash. Well there is a smoked ham hock in the fridge waiting for me to turn it into pea and ham soup……. I would make fried rice first using the NewWave Multicooker. G’day! Beef Cheeks is something I have never done to date, true! This NewWave Multicooker would inspire me to do! LOVE promoted South Australia…OUR great state…would use a beautiful Barossa Shiraz or Cab Sav, enhancing flavors on the day! Adding a little bit of my creative twist…would love to share the experience…as with new foods, ingredients, recipes, appliances, I REALLY do like to play! Moroccan vegetable stew with chickpeas! Would probably opt for a lamb shank soup, for these cold nights! Cuban Black Bean and Potato Soup. The distinctive flavor of this soup comes from a sofrito, a puréed mix of onions, garlic, and bell peppers. A mushroom and chicken risotto. I would give the deep fryer function a red hot crack and make some tempura veges. Yum! Slow cooked lamb shanks for your lamb shank and mango chutney pies – Yum! I’d never say no to donuts!! Definitely cook donuts first. Something I haven’t made for a while, Irish Stew, would love to try a lot of new dishes too. My favourite slow cooked meal. Corned beef with an honey, orange and mustard glaze. Either that or a slow cooked beef and vege ragu. I think i’d make a good old hearty beef and vegetable soup! I’d speed up the process for a Moroccan saffron chicken tagine ! Chicken and Basil Risotto, so I don’t have to stand at the stove and stir, and stir, and stir until my arm feels like dropping off. I can imagine cooking a wonderful Madras curry in my new 6-in-1 Multicooker. Something to look forward to on a cold winter night! Lamb Shanks, a huge family favourite, everytime they are cooked I get the “Gee Shanks Mum” jokes for a week! Curried lamb shanks for me. I make the best in the universe. I’d make some pulled BBQ pork, delicious alternative to burgers for those beautiful summer evenings when entertaining friends – serve with homemade apple slaw and Bob’s your uncle! I’m a big fan of pulled pork of late… this machine would sure speed up the job and keep the house cool! I’d brown off then super slow cook some lamb overnight, ready for a lazy weekend lunch with crusty bread and condiments. I wuold be able to get rid of 4 applicances and finally have some room in my kitchen cupboards! A nice chicken and corn soup! perfect for a flu remedy and able to be cooked without hassle! My Portuguese chicken with new potatoes. The chicken is marinated with a combination of herbs and spices, stuffed with lemon for flavour. This would be a great help in the kitchen!! I have a toddler and expecting my second bubba in about 3 weeks. Wil make cooking for the family so much easier! definitely a risotto…..I am Italian and I can’t cook a risotto to save my life!! I would make Pumpkin & Goat Cheese Risotto! Slow cooked red wine Osso Buco Beef Stew, with a creamy butter polenta side. That sounds AMAZING Nicole, and a nice Tribute to your Dad. I would use it to cook chips!! CORNED BEEF for me… Cooked quickly in the Multicooker and then kept warm to tenderise further and feed the hoards as they dribble home after work. Italian meatballs like my mum used to make. The most wholesome vegetable soup with puy lentils…. Good old fashioned chicken soup, like Nan used to make. Chilli beans, dried beans cook so well in a pressure cooker, no need for soaking them. The first dish I would make would be doughnuts. Nothing beats fresh hot doughnuts rolled in cinnamon sugar! Great giveaway! Moroccan Lamb Shanks with pumpkin, dates and spices….. Deliciously browned at the start and then it’s flavours develop…. Ooh-la-la what a meal so relish not matter how old you are!!!! I dont know what I would cook first, I would go through my old cook books and get into action!! Spicy Rendang Padang, it’s a traditional Asian food that should be cooked with firewood in a huge pan, cooked it for more than 10 hours so the meat will be juicy and all the ingredients soaked up and dried. The greatest thing about the food is it can last for a month without changing its taste!!! I bet this multicooker can do the same in a short time, can’t wait to try!!! I would make my Nan’s curry chicken. It would be so tender and flavoursome. Oxtail with plenty of vegetables. The meat would just fall of the bone and wouldn’t take as long as cooking in a pot on the stove. Oxtail is so yummy. I would cook my own homemade chicken and sweet corn soup that all my friends love and are always asking me to make for them to take home… i must cook at least 6 per week and this would be so great to win this..thank you for giving me this chance……. I would make nan’s Lentil Soup, its full of veges and bacon and lentils, perfect to warm the bones on cold nights…. I would cook a hearty casserole, beef and Mushroom….Served with some crusty bread and a glass of red wine. Rabbit cooked in red wine,absolutely divine. Slow cooked osso bucco that melts in the mouth should be easy to achieve thanks to New Wave Technology. hearty braised steak and veg to fill our bellies and warm us through on these cold winters eve’s. Spicy lamb shanks with slow cooked sweet pototatoe…. yum yum yum… goodbye and hoorah to winter food! I would have to make my melt-in-the-mouth Osso Bucco. Lots of tomatoes, stock, and a splash of red wine, rosemary and complementary vegetables.It takes around five hours on the stove, this slow cooker would be so wonderfully handy, and used very often. I would make my favourite beef stew. pea and ham soup mmmmm yummy!! Chicken Korma and rice so I can test out a few different functions of the multicooker! Chicken and dill risotto – a family favourite. Chicken Nuggets and Chips! My Fave meal of all time! I think a nice and spicy chili would be what I make first! It would be too awesome to have this in my room as a uni student! I’ll make a cake that tastes better than the ones outside! A big pot of chicken and vegie soup to cure our common colds and ease the winters chills from the inside out. 6-in-1 sound amazing and healthy for you, anything to help me make my life easier with my chronic pain illness to a must have. Lamb Rack with veggies yum!!! This would be perfect to make my Beef, Mushroom & Stout Pies. I would love to prepare world famous yummy yummy tasty tasty Hyderabadi Chicken Biriyaani for my friends using this 6in1 Multicooker. oooh…this would PERFECT for making a lamb biryani dish! Pea & Ham Soup! So thick and yummy! Shredded Beef Sliders, this cooker would be perfect for slow cooking the beef! Love to make biryani to my family as this is one of the old and traditional cook which is cooked using this. Slow cooked Mouth Watering American Style Sticky BBQ Ribs. Mmmmm Ribs! Soup. I love potato and leek soup. I would make Dr Pepper Slow Cooked Shredded/Pulled Pork… Hehehe having to think about what I’d cook, has me literally salivating! There’s just so many things that would be perfect! I would make soup. All kinds of soup if I won the NewWave Multicooker. I’d make Dublin Coddle! Yum! Slow cooked pork so I could make pulled pork, such a treat and so tasty. I would love to have this at home and make a delicious Sri-Lankan Chicken Curry like my mum would make from scratch! She would be proud! I’d make a slow cooked Butter Chicken. The aroma from this dish is amazing and the time spent cooking, the meat just melts in your mouth!!! YUM! Love to make ox tail soup! coz I’ve tried to cook it when using other cookers,but they cannot do it and waste my time. I really want to try this 6-in-1 Multicooker,wish it will give me a big surprise! Salivating at the thought of coconut chickpea and vegetable curry and then cooking some fluffy rice to accompany. Yummy!! I’d make traditional yellow Fried Chicken, its hard to fried using fry pan, because the oil come out make my kitchen full of oil. So i’m surprise with new wave 6-in-1 multicooker function. Thats awesome if i can do deep frying using it. I hope new wave 6-in-1 Multicooker is my cooking solution. No need other stuff in my kitchen! Let my try it please.. Thank you. Sticky Slow Cooked Pork Shoulder to serve with apple coleslaw in wraps. Some sort of dinner for when we are away camping so that I can chuck it on and relax with a glass of wine! Wow just what the Temple family order……….I would be the kitchen wizza with all the functions, bring it on baby!! I love to try new techniques of cooking by using new kind of utensils. THIS LOOKS SO HI-TECH THAT I WOULD DO……. i Vindaloo (slow cooked) with a side serve of Jasmine i Rice. I would make an Italian Style Braised Ox Tongue in Red Wine! my first dish would be yummy dutch curry chicken, with fluffy white rice!! Most definitely the first dish would have to be indian style lamb shank curry! My fav dish slow cooked lamb chops in red wine sauce, served with creamy mash potatoes. Hainanese chicken with preserved lemon. When the chicken is cooked, I’ll chuck in some grains and make super creamy and fluffed rice. Gold stars to one pot cleaning!!! So hard.. Would it be pulled pork, a southern style Thai fried chicken or perhaps a slow cooked ragu… Or maybe a pressure cooked pumpkin and coconut Dahl. Ok pulled pork for some classic sandwich action. Beef Stroganof, with this beauty, the beef will melt in your mouth. I’m a ‘lamb shanks’ fan, and I’d love to try cooking them in this awesome pot! Chicken cacciatore and rice …but my kids would want the French fries 🙂 if they knew if could do that too. Beer battered chips….SUCH a treat and I’ve never had a fryer before, so I’d splurge on something naughty buy amazing first up! I’d make braised steak,on the slow cooker setting. I’d cook my mum a Sunday roast, just like she used to do for me! My Mums Homemade Chicken Soup recipe! Goat curry. It needs to be cooked for hours until the delicious meat falls off the bone. It’s a lovely, low fat meat that is underestimated. A rich and spicy Thai Green Curry, perfect for a cold evening! A gorgeous beef bourgignon. Perfect for cold, wintry nights and so yummy. Christmas Pudding, then it has plenty of time to mature! If I won I would cook one of my favourite meals, chicken chassuer, which the whole family loves. Our family favourite – corned beef. Yum! I would make lamb shanks! Oh great question. I would make a delicious comforting risotto! Yum. Such a great winter meal. Magic will be made in my kitchen! I would make Red Wine and rosemary lamb casserole. I’d make a chunky moroccon lamb and pumpkin stew. Just perfect for this time of year with the cold weather. And I love recipes where I can put it all in my slow cooker and just forget about it. Hainan chicken rice using the rice cooker function. Too easy! I would love to try the Mushroom Risotto … not sure I believe that it can cook in 7 minutes. A Vegan, gluten-free, extra healthy linseed soup with potatoes. Yummy !! The Quark donuts! I love trying new things and after discovering that a ‘Quark’ was not an exotic sort of animal but in fact a cottage cheese donut with the bonus of being gluten-free, I was inspired! Herbal Mutton/lamb soup.. asian style! a huge bowl of chilli, the serve it with corn chips for a massive group of friends and family showing off my lovely new kitchen god. Id whip up a Beef Ragu, mouth watering and less for me to do! Golden Syrup Dumplings for sure! In an appliance like this it would be as much fun to make as much as eat! I am a uni student so this would make my life so much easier to cook good hearty healthy food!!! My first dish would have to be my godfathers traditional Indian Rogan Josh!!! I’d cook an Indian feast (my favourite); lamb korma in the slow cooker, spiced Indian rice in the rice cooker, Dahl in the soup pot, Indian flat-bread on the electric pan, deep fried vegetable fritters, and for dessert an Indian Steam cake in the steamer. YUM! I have ben wanting to attempt Churros for a while now. Here’s a great excuse. lamb shanks, meat falling off the bone, succulent juices to make a gravy with potatoes and pumpkin. I would love to try a Thai dish. Tom yum soup comes to mind, omg, Ive made myself hungry. Would be delicious. Beer braised goat curry made with goat’s cheese and Mountain Goat stout, appropriately for extra goaty flavour. Pulled pork, or a pot roast, or Yorkshire puddings or a seafood basket or maybe a rice pudding…….oh so many decisions! The first thing I would cook would be my locally famous family recipe for slow cooker jam ball doughnuts. An apricot and walnut chicken casserole – I can almost taste the wholesome scrummyness now! The choices are endless but I think the first winner would be Beef Stroganoff served with coconut rice, and for dessert (not made by the NewWave) Paleo strawberry ice cream. Salivating at the thought. I would make a wholesome chocolate cake to celebrate because it would feel like my birthday. Slow cooked lamb shanks would be so flavoursome in this. It would save me time to deal with my baby but still serve up a delicious hearty meal! Marinated lamb shanks, it’s my favourite lamb dish. It’d be cooked to perfection, and the lamb would be tender, moist and very delicious. I have been dreaming (literally) of making Texas Pulled Pork, I have a recipe stashed in my bulging file of clippings, and would definitely ‘pull’ it out to give it a go! I’d make rice – I’ve always wanted a rice cooker but couldn’t justify the storage space and my kids complain about Mum’s ‘soggy rice’! My own creation of Prawn & Mushroom risotto. It’s a family favourite. Warms you through with that spice. I’d cook a piece of silverside. Yum! Minestrone for my parents because it’s their favourite!